The Parakatathiki (“Charge”), when the Eucharist is placed in the hands of a newly-ordained priest by the bishop, and he is charged by him to guard it until the Second Coming of Christ. 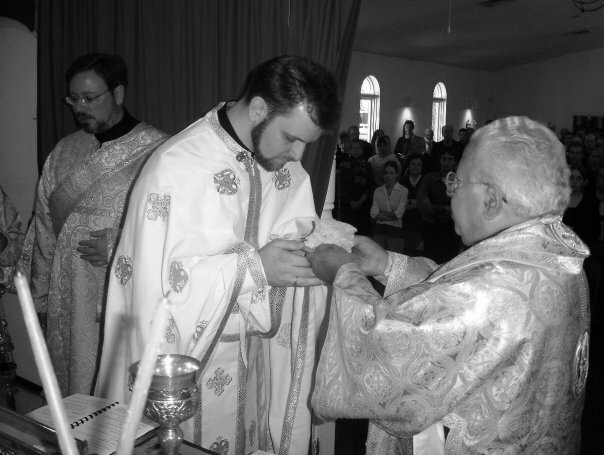 This picture is from my own ordination. A post of mine from March, Evangelicals at the Eucharist, has inexplicably been getting a bit of traffic again over the past few days. I was assured in the comments that, in my criticisms of Dr. Peter Leithart’s call to Evangelicals to return to putting the Eucharist at the center of worship, I was pinning the wrong guy. But a close reading reveals that I was not so much attempting to critique the full body of Leithart’s work, but rather speaking in the same “room” that he was speaking in, i.e., modern Evangelicalism, which is as Zwinglian as the day is long. Leithart might have a relatively “high” view of the Eucharist, but the people he’s speaking to, on the whole, have almost no view of it at all. Why? Because they have no priesthood. That said, in the midst of the comments was posted a new piece from Leithart, Too catholic to be Catholic, published on Monday, in which he professes himself “too catholic to be Catholic.” The closed communion discipline of Roman Catholics and Orthodox makes them “sects,” and he is “too catholic” ever to do such a thing. It is essentially a “Why I’m not Roman Catholic or Orthodox” mini-manifesto. I read Dr. Leithart’s post with interest, and its internal contradictions are really quite astounding. He is so “catholic” that he would welcome the Orthodox and Roman Catholics into communion, while in nearly the same breath actually proclaims us to be idolaters! While it’s not made evident in this post, it is also the case that he borrows heavily from theologians in those communions, which may be part of why he has been brought up on heresy charges (acquitted, mind you) by his own denomination. By his own definitions, he’s actually using idolaters as a source of theology. If this is catholicity, it has to be the weirdest type I’ve ever seen. Catholic here seems to mean being so inclusive as to accepting to communion not only heretics but even idolaters. (Remember that an idolater is someone who unrepentantly worships an idol as a god.) I wonder whether communion should have any limits at all then—resumably not, as he decries the “closed communion” of his fellow sons of the Reformation. Should it even be extended to the unbaptized? It makes little sense to me that Leithart would remain apart from the Orthodox and Roman Catholics on the basis of his doctrines—doctrines which proclaim us and most Christians throughout the ages to be idolaters—and yet somehow chafe at the exclusivity of the tradition of closed communion? It also occurs to me that, in speaking of communion, when you have to refer to an ecclesial world rather than the Church, you have a big theological problem. For the Orthodox, the Church is communion. In arguing for his “catholicity,” Leithart at least appears to have accepted the Roman Catholic definition of catholic, which is “universal.” Mind you, Rome applies this universality in terms of its governance, but Leithart appears to be applying it in such a sense that it obliterates the very point of sound doctrine, which is to guide the believer in his communion with Christ in His Church. Either Leithart would gladly admit idolaters (the Orthodox and Roman Catholics) to communion, or else he is simply unhappy that the lines that he would draw for communion are different than the ones that others do. Either way, it makes little sense. I suspect he means something different by catholic, however. In any event, the traditional definition for catholic is not the ultramontanist one Rome uses nor the confusedly pietistic one of Dr. Leithart, but rather simply what the word actually means—katholikos, from kata and holos, “according to the whole.” That is, the catholic faith is the whole Christian faith, and the one Church is catholic because she maintains the wholeness of the Christian faith, not merely a few minimal parts. One cannot, for instance, debate whether Scripture must be somehow read apart from the tradition that produced it or whether succession from the Apostles avails anything at all, considering such things non-essentials, and yet somehow be catholic. Likewise, his preferred self-moniker, reformed catholic, also makes little sense from the proper definition of catholic. If his faith is truly whole, then why should it need reform? Even if catholic just means “inclusive” or “universal,” then why the need to be “reformed”? It seems to me that no reformation is warranted for someone who wants to commune with idolaters. Why reform them or anyone else when they’re not cut off from your altar? What is actually gained by reform, if not communion? I must admit that I honestly do not understand the Leithart version of catholicity (though I suspect what he really means by it). He seems to be a man very much concerned with sound doctrine, and yet soundness of doctrine apparently should have no effect at the chalice. But St. Paul warns us otherwise. As for how becoming Orthodox or Catholic reflects on converts’ former religious experience, Leithart seems not to be aware of something that is amply available in nearly any convert story out there. Most converts do not, in fact, see their previous religious experiences as wholly devoid of grace, as being defined by unmitigated darkness, but rather as having been in some sense a propaideia—a preparation for receiving the fullness of the Christian faith, a preparation for which they are usually quite grateful. I know very few who look on their former communions as Leithart fears they should. Of course they will look on where they’ve converted to as being better, else they wouldn’t convert. But Leithart would have someone whose convictions run that way stay where he is! There is quite the irony that, while he quails at the idea of an ex-Protestant convert to Orthodoxy or Rome looking on his previous Protestantism as lacking something, he himself looks upon the Orthodox and Roman Catholics as outright idolaters. Thus, the only solution to this convert syndrome seems to be for everyone to stay where he is. The only possible solution to the extreme contradictions of doctrine between the various communions is pietism, the denial that doctrine even matters. He seems to apply this pietistic dogma-muzzle selectively, though. After all, he still has big criticisms for many of us. But if we were to convert to his way of thinking, would we not then have to look at our time in our previous communions as, in his words, “living a sub-Christian existence”? In the end, it seems that this argument against conversion is really just a cryptic argument that his Christianity is indeed the one true kind. I have no problem with that, but he should just say it: Don’t become Orthodox or Roman Catholic, because they’re wrong and they’re idolaters. Become (his variety of) Reformed, because it’s the one true way. But I think saying it outright wouldn’t be “catholic” for him. It seems to me that catholic, at least in this piece by Leithart, is really just a synonym for pietism, dressed up in a grand old word with powerful theological import, yet evacuated of its proper meaning. And here’s another Orthodox response (part 1) to Leithart, written by a member of my parish, pointing out how Leithart’s “Reformed catholic” view is at odds with most of the Reformers and has its provenance in Zwinglianism. See also part 2 and part 3. Also worth reading is this thorough response by a Roman Catholic, especially pointing out the deep connection in the ancient Church between doctrinal orthodoxy and communion. It seems to me that he again wants to define a word (idolatry) in a new way and then claim that his definition is the right one. We “brethren” of his are, it seems, too idolatrous to be Idolatrous. Rome left the Church through heresy and schism, and Protestants left Rome through the same process. It is now nearly the height of anachronism to demand that the Orthodox join the (at least) twice-separated Protestants in their innovative doctrines and man-made worship. In any event, the analogy doesn’t really hold. Ancient Israel is not the Church but only a foreshadowing of it. One could still be part of ancient Israel on the basis of birth and circumcision, but entering and remaining in the Church require the apostolic faith. One could not really divide from ancient Israel, but division from the Church is clearly shown as possible in not only the New Testament but in all subsequent history. It’s easy (there’s that word again) to call someone a “sectarian” when you don’t want to measure up to what it takes to be in communion. But the one who has cut him off from communion from Orthodoxy is not the Orthodox, but himself, and he remains so deliberately, thus revealing himself as being the sectarian. A commenter on Facebook also adds this: His “clarification” is just as confusing as his previous post. The divided kingdoms were divided as God’s judgment against them, and to top it off the Northern kingdom was completely eradicated. Does this mean then that God will send in a group to eradicate the sectarian “northern kingdoms” of Protestantism, Orthodoxy, and Catholicism? Another commenter has this to say: There’s no difference between ‘high place’ and ‘golden calf’ worship re: the Northern Kingdom. Both were part of an attempt to accommodate YHWH worship to the then current culture by Jeroboam son of Nebat (in fact, Scripture generally lumps them together as ‘the sin of Jeroboam son of Nebat’). I see nothing in Orthodox or Catholic worship that compares. Quite the opposite. The comparable current trend is evangelical worship that attempts to accommodate the worship of Christ to the current American culture. A lot of the comments on your blog tell me that there are some folks out there who need to go back and reread these passages closely. Before he brought up I Kings for no good reason, I thought he was connecting the ‘idolatry’ charge directly to the Eucharist…if so, that’s an old (and to my mind valid) charge made by the Reformation against Rome (at least since the Libri Caroligni), but doesn’t apply to Orthodox practice at all. Post-Evangelical? I Can't Do That. Wait, didn’t the Reformed (and most other Protestants) practice closed communion up until some time ago? Is he too Catholic to be old school Protestant too? Quite confused. I recall reading Wesley’s diary and he was often attacked by his parishioners for refusing to let some commune because of their sins (and idolatry is certainly a sin!). At least Wesley was consistent and disciplined. As you say, I do love my heritage (mine being the Methodist Church before becoming Orthodox). I was referring to the sort of closed communion where one is not admitted if one is not Lutheran, Reformed, Methodist, etc. in good standing with their respective denominations. Though you make a good point that ‘closed communion’ needs to be further defined. I hadn’t thought of that. Thank you. Interesting, I wonder if you might be missing be the point, however. Almost your entire critique of Leithart is based on matter to which he gave one paragraph. Actually, not really. My comments are about his rather creative definition of catholic, which is what his post is about. I think the fruit of your argument rests upon matter to which he gave one paragraph. I fail to see where your discussion of katholikos gets Leithart – he is the one advocating communion with the whole of the Church, the whole Trinitarian, Christ-confessing Church. Katholikos is not a word that means “every real Christian everywhere.” It refers to the fullness of the Christian faith, not to the mishmashed, contradictory collection of doctrines and practices that persist in great variety among every person who happens to call himself a Christian. That is, catholic refers to the faith of the Church, not to an amalgam of every person claiming to belong to it. As to whether I’m only talking about one paragraph, I don’t agree. But even if I am, how does that matter? Haven’t Christians spent oceans of ink in discussing mere handfuls of words? I saw a link to Leithart’s post on a Lutheran friend’s blog, and had much the same reaction you have had. See my comment on this thread, in which I take Dr Leithart to the theological woodshed. I should add, Fr Andrew, that I too noticed the stark contradiction between his whining about closed communion and his accusations of idolatry; but my comment on John’s blog was already too long so I didn’t call Leithart out on that. As a current Protestant and inquirer into Orthodoxy, this article really hits home. Sadly, the attitude that Dr. Leithart displays is all too common. It forces those such as myself, who are seekers, to feel isolated and ashamed. Although, I understand how a Protestant could take offense to someone seeking a fuller experience in Christ. But they must understand that when they respond in anger or condemnation, it’s their flesh speaking. And even those that feel ashamed of their Christian journey, that too is a source of pride. “I want to be right at all times!” Instead, I want to humble myself and ask God, “Ok, where are you leading? Lord, I want to follow your calling through whatever path you’ve laid before me.” God has taken me through Protestantism for a reason, and sometimes that’s not always clear as to why. One must humbly await the revelation. But to quickly condemn my own journey or another’s journey is the hypocrisy that Paul points out in Galatians, I feel. Your post is very encouraging Fr. Andrew! Thanks for the link: great post. I agree that Pr Leithart’s definition of “catholicity” is somewhat idiosyncratic, and his desire to commune with those he sees as idolaters is equally strange! I think you make an excellent point, too, about how a convert looks back on their previous experiences: with their post-conversion state seen as a fulfilment, rather than repudiation, of their pre-conversion life. I’ve been Orthodox for 3-1/2 years coming from a Reformed background. There is one question, mentioned briefly by you and Dr. Leithart, that I continue to wrestle with, “How do we view our former Protestant confessions?” What I cannot get past is this – by saying that Orthodox is just a “fuller expression of Christianity,” do we not make Orthodoxy just another “sect” competing for peoples minds? If I can be a Christian and on my way to the Kingdom as a Protestant with the same hope and odds of being accepted by God, then heck, I’m going to be a Protestant….it is a whole lot easier. Don’t get me wrong, I love Orthodoxy or I would not have converted but it has been “hell” in many ways since my conversion. Life was easier and simpler as a Reformed Christian. Well, for whatever it’s worth, I would not say that Orthodoxy is just “a fuller expression of Christianity.” Orthodoxy is Christianity. It is the Church. The question, really, is what all those who claim Christ yet remain outside Orthodoxy actually are. To be honest, we don’t actually have an answer from a theological point of view. The technical terms heretic and schismatic really apply only in fairly narrow circumstances. We can affirm what they believe if it is true. This is true in general, hypothetical terms, viewed only from a given moment in time. In more specific, personal terms, each convert has to determine for himself what his past experience means. I prefer the idea of propaideia, i.e., that God was leading me to Orthodoxy all along. As for what that experience means for people who are yet outside of Orthodoxy, I don’t think we can say with any real certainty except outside of time, when the eschaton comes. That’s when it really matters, anyway. When I’m talking with my Evangelical family and friends and they asked, as the often do, “Do you believe that I should be Orthodox to be saved?” – what should be the answer? Another question/thought. Is it not correct that we Orthodox teach and believe that if one does not eat Christ’s Body and drink His blood, “you have no life in you” as Christ himself said. How then do those outside the Church have life in themselves? This is especially troubling when Evangelicals, like my father, say that Communion is irrelevant to life and salvation. Christ gave us the Way. That Way is the Orthodox Church. What happens when people depart from the Way? What happens to the descendents of those who departed from the Way? We don’t really know. We don’t even know what happens to people who have never heard of the Way. But the safest route is the Way that Christ established. It’s no guarantee, of course—we really have to walk the Way and not just start on it—but it’s far better to be on the Way than to take one’s chances outside of it. Independent of this post, I emailed Dr. Leithart about this issue, and he responded that by liturgical idolatry he means something more like high-place worship than golden calf worship. I understand where you’re coming from, but I believe you have misunderstood his point. That strikes me as a distinction without a difference. Idolatry is a big word. Exactly how is “high-place worship” okay while “golden calf worship” is not? Nevertheless, I think my point still stands—he either wants other communions to be more liberal with him than he wants to be with them, or else he is essentially saying that doctrine really does not matter. Curiously, even though those two statements contradict, I think he’s saying both things. Asa did righteousness before the Lord all the days of his life, nevertheless the high-places were not removed. High-place worship wasn’t ok, and Hezekiah was more right than Asa. A prophet could have rebuked Asa. But Asa was still a good king. It’s one thing to tolerate idolatry, but another actually to engage in it. Leithart said outright that Orthodox and Roman Catholics are idolaters. We don’t merely tolerate the use of images in other churches; we actively encourage their use and quote the Seventh Ecumenical Council in anathematizing those who call such things idols. Maybe we read the high places differently. (And maybe I read it differently from Dr. Leithart too.) I read the high places as worship of the Lord, but not in the temple. And therefore forbidden because it abandoned the temple, nevertheless not idolatrous in the same way the calves were. When Saul waited for Samuel, Saul was waiting at a high place. At that time that was ok, because the tabernacle had fallen apart, and the temple had not yet been built. But after the temple had been built, the sort of altar Samuel worshiped at was forbidden. They were to worship in Jerusalem. Israel is treated as considerably worse than Judah, and at least as far as I can understand Dr. Leithart, he is saying that the Orthodox and Catholics are like the good, but not perfect, Davidic kings–like Asa, or Uzziah. I may be wrong–I just searched Biblical Horizons to see how James Jordan treats the high places, and he treats them as image centered, and thus idolatrous in the full sense. But the email I sent Dr. Leithart argued for something different, and he seemed to agree with my arguments. Whatever the case, the word used was idolatry. That’s the worship of false gods. No way around that, I’m afraid. Yeah, I agree he should have used a different word. Honestly, a man as smart and well-read as he is chooses his words carefully. It would be nice to be able to read an accusation of idolatry(!) charitably, but I don’t really see how it could be done. Let’s assume that Leithart’s definition of catholic is at least partially legitimate, or even just scrap the term “catholic” as he uses it and substitute the word “inclusive.” There is still a problem with his way of thinking. The issue Leithart is addressing–Jesus’ inclusiveness to outsiders–has a very concrete and specific context in the New Testament. Namely, Jesus is accepting Jewish outcasts and Gentiles to table fellowship. This would not normally be allowed by the Jews because of ritual impurity/uncleanness. Yet Jesus opens up fellowship to these outsiders. Nevertheless, in the New Testament, as St Paul makes clear, although this table of fellowship is open to “unclean” people (per the definition of the Mosiac Law), as well as “clean” people, it is ONLY open to those who put their faith/trust (pistis) in God. And, of course, putting one’s faith in God which allows you to eat at the table of fellowship with Paul means putting your faith in God as Paul and the other apostles taught it–not however you wish to fancy that you have put your faith in God. Based on this context, I really don’t see the problem with closed communion. The Orthodox and Roman Catholics, for example, do not close off communion based upon one’s ethnicity, social status, etc. There is basically one criterion: you at least outwardly (who but God can determine inwardly?) confess the faith of the particular church. But anyone is welcome to confess this faith and come to communion. There is no exclusion because you are not wealthy or because you had a certain disease or because you are not a certain race. Anyone can choose to become Orthodox or Roman Catholic. I don’t see how a church can practice communion any other way. The entire idea of “communion” is based on having something in common, and that something is obviously a specific faith. Given Dr. Leithart’s generally highly acclaimed status as a prominent Reformed theologian and writer, I am surprised and rather disappointed that his response was full of so many internal contradictions. It is difficult to believe that proponents of open communion are truly as charitable in attitude or as universal in outlook as they claim to be when a person who would invite me to his altar might also think of me as an idolater! Why would I want to commune with someone who holds such a mistaken view of my faith, whose beliefs I clearly do not share? What then is the point of offering open communion if you invite people to commune alongside you whose beliefs you might openly scorn or reject? It seems impossible to seriously experiment with elements of ‘High Church’ Eucharistic theology as Dr. Leithart has while steadfastly dismissing the very Churches which practice it as *worshiping* saints and images! Leithart should simply state what he only hints at between the lines: he cannot bring himself to become Orthodox or Catholic because he cannot bear to adopt some of our doctrines and practices which he mistakenly considers idolatrous. Thus, while complaining that we deny him the chalice because his faith is not ours, he thinks his own theology is superior to that of those whom he would nevertheless offer communion in ‘catholic’ fellowship! He holds to the contradictory position that he is more “catholic” [unfortunately interpreting the word as ‘universal’ in the traditional Roman Catholic juridical use] than either the Orthodox or Catholics because he happens to believe in communing anyone, even people he considers idolaters. Thus he considers his practice of open communion more Christ-like than the Orthodox or Catholic Churches which ‘uncharitably’ maintain closed communion. This is at its best a very patronizing attitude toward those he would nevertheless commune at his church. I would ask Leithart to answer: what would communion be ‘kata holikos’, in his view? What *is* communion according to the ‘wholeness’ of a “catholic” Church he believes spans multiple denominations and creeds? Since the people he would invite to communion have varied and often opposing ideas about what communion actually *is*, what does he consider it to be? What “wholeness of faith” can exist within such a universal approach to communion when he would offer it to people who reject his faith, whose faith he himself rejects? He justifies his condemnation of the veneration of the saints and images not with any Patristic quotes, as that is impossible (since all the Church Fathers defended and expected veneration of the saints and icons) but with a vague reference to Scripture, which obviously prohibits idolatry. Leithart conflates Orthodox and Catholic veneration of the saints and of icons as idolatry, which he would know is not the case if he actually read the Catholic and Orthodox Church Fathers, especially St. Athanasius and St Germanus. Thus, he reveals himself to be rather ignorant or dismissive of the extensive Patristic tradition and ecclesiology which has always distinguished between such reverence and honor (doulia) for these exemplary persons and holy images, and the worship (latria) offered to God alone. This ignorance is rather surprising given his status as a prominent theologian. Even if he believes he can subordinate the witness of the Church to Sola Scriptura (a deeply problematic view in its own right) I fail to see how the Scriptures prohibit giving honor to the presence of God in sacred images, since in Exodus God commanded the Israelites to make religious images for His glory (to fashion the golden Ark of the Covenant with winged cherubim upon it, around which the Israelites and King David later danced and prostrated as they processed into Jerusalem). Thank you for putting out the Greek word propaideia, Fr. Andrew. It is nice to know there is a proper theological term to describe the spiritual and soulful preparation converts go through on their way to Orthodoxy. This is truly a wonderful picture! Thank you for sharing it. God grant you many years! Thank you. Maybe an inchoate sense of this kind of confusion fueled my disenchantment with Touchstone and First Things. Could you point me to the specific writings of St. Athanasius and St. Germanus in which they defend veneration of icons and saints. To All: I thoroughly enjoyed reading the comments in response to Fr. Andrew’s excellent rebuttal to Leithart’s misguided understanding of Catholicity. Keep it coming! The fact remains that Rome left the Church through heresy and schism, and Protestants left Rome through the same process. It is now nearly the height of anachronism to demand that the Orthodox join the (at least) twice-separated Protestants in their innovative doctrines and man-made worship. In any event, the analogy doesn’t really hold. Ancient Israel is not the Church but only a foreshadowing of it. One could still be part of ancient Israel on the basis of birth, but entering and remaining in the Church requires the apostolic faith. One could not really divide from ancient Israel, but division from the Church is clearly shown as possible in not only the New Testament but in all subsequent history. Again, Leithart presumes his own relativistic ecclesiology and simply expects the rest of us to follow. It’s easy to call someone a “sectarian” when you don’t want to measure up to what it takes to be in communion. But the one who has cut him off from communion is not the Orthodox, but himself, and he remains so deliberately. This Leithart fellow is turning out to be quite the stump. Life will be simpler if you plow around it. You seem to think that my life is somehow complicated by theological engagement. 🙂 It’s not! I think these things are very much worth engaging, discussing and getting out for others to examine them, as well. Doctrine matters! There is just so much of a disconnect between us that I think a lot is lost to the intertubes that would be more easily worked through in a real discussion. And your position is so foreign to me. As far back as I can remember realizing that there were lots of different churches and doctrines I’ve desired the unity of the Church. When I was angsty and pubescent that looked like a lot of debates about the covenants and the sacraments with baptists and lutherans and other presbyterians. I’ve never seen anyone change their mind in a debate. But we all confessed the same creeds, we all believed in the same Gospel. It wasn’t that I believed credobaptism was any less wrong, but I’d seen Christ work through it, so I changed my tone. I want to help my weaker brother, and be helped by my stronger brother – not beat them over the head. If the attitude of your church really is one that stands to the side of the issue and says we were here first, so (or, closer to your words, – hey they left us -, which is also closer to these “Am I my brother’s keeper?”) not our problem, then I don’t see any Christ or any loveliness in that. What is your deal, I mean specifically, what would it take (at the real root) for you to extend your communion to someone? Is it a complete agreement on doctrine? Is it submitting to the same authority? (And if that, what authority? For instance, I would say Christ, but I’m sure that’s too easy for the Orthodox). And then if Orthodoxy alone is the Bride of Christ, I would presume that you have the greater burden towards your “separated brothers”, but you take an attitude of dismissal and at times, a purposeful malice – like where you twist Leithart’s words to mean that he wants everybody to join his church (and when he is obviously saying the opposite?). But it is important for me to remember that while the Church will not be healed by each piece of the body demanding that they have the apostles, it will also not be healed by general agreement, Christ alone can work in and through and make complete. For whatever it may be worth, I don’t work with people in person in these matters the same way I do those online. Most folks who come here are looking for a debate and usually leveling an attack against Orthodoxy, so I will gladly explain how their attacks are wrong and where their own theology went awry. Doctrine actually does matter. That’s one of my central affirmations, especially in theological engagement. That affirmation offends a lot of people, probably because they’ve been taught for so long that doctrine really does not matter, that the people who separated over doctrine were really just being contentious over something that’s not all that important. I personally think that’s bunk, that doctrine really does matter. There have been too many saints over the ages who died precisely at the hands of heretics. In any event, my approach is not the triumphalism you take it to be. It is not triumphalistic simply to affirm the ecclesiology that Orthodoxy has always believed in. Or, to put that same dynamic into another context: Would it be triumphalistic for you to insist to a Muslim that he give up his faith and be baptized? Would it be triumphalistic for you to insist that a Mormon give up his anti-Trinitarianism and distorted Christology? Or what about a Jehovah’s Witness? Or a Hindu? You see, everyone draws the line somewhere. The act of drawing the line is not in itself an act of triumphalism. As for my sense of responsibility to others, I absolutely believe that I have it, and that responsibility entails preaching the true, unadulterated, unaltered Christian faith as it was once for all handed to the Apostles. I have published hours upon hours of podcasts dedicated to that, not to mention the book Orthodoxy and Heterodoxy, whose purpose is precisely comparison and contrast of Orthodoxy with non-Orthodox religions. That aside, the majority of my ministry is spent in doing things that folks who only interact with me online never see—I pastor a local parish. I lead prayer services every day, preach at least a couple of times a week, visit the sick, hear confessions, help keep parish administration in order, organize charity, lead pilgrimages, baptize, connect with the local community, participate in the clergy ministerium for my town. And all that is done while still trying to be a good husband to my wife and father to my three children. You ask what it would take for me to give Holy Communion to someone: It takes exactly what it would for every other Orthodox Christian cleric worldwide—the communicant has to become an Orthodox Christian. For us, Communion is not a means to unity, just as sleeping with a woman is not a means to marriage. Rather, the intimacy of Communion comes out of an existing unity. It does unite the Body of Christ together in its Head, but it is the Blood that flows through an existing Body. Pouring blood on a dismembered piece of flesh does not put it in union with the body. It must be reattached first. As for my supposed “purposeful malice,” well, I will of course admit to being a sinner. But I have no malice toward Dr. Leithart or you, and I am only reading his words as best as I can and responding accordingly. I obviously do not agree with him, and I certainly do not agree on the consequences of what he has been saying, but that does not mean I am “twisting” what he is saying. He’s the one who called me and my whole Church idolaters, after all. There doesn’t require much twisting to read that in a pretty negative light. With roughly 200-300 million Orthodox in the world, and more than a billion Roman Catholics, he’s pretty much cast deep aspersions on most of the world’s Christians. I know that the particularism of our ecclesiology offends you, that you do not “see Christ” in it, but I do not see Christ in being accused of idolatry. Nevertheless, I believe that such an accusation is sincere and not out of malice. It is not inherently unloving to believe that doctrine matters and that those who distort the truth are wrong in doing so. In fact, I find it decidedly unloving to pretend that such things don’t matter. The Lord Himself had harsh words for such distortions in His own time. Thanks for your responses. Of course doctrine matters but as someone else (Leithart?) pointed out, uniformity is not the same thing as unity. That’s why my question is, what is being an Orthodox Christian? Is it doctrinal uniformity? Is it submitting to the authority of a head patriarch? Where exactly is the rub? I can’t help but notice that you have been ignoring a quite crucial argument by Fr. Andrew: your views on sharing communion are recent, the product of pietism and 20th century dominationalism, and something that is foreign to Christianity as it has been practiced for nearly 2,000 years. If you do not reject this characterization (and you may, of course) then the implication of your position (and Leithart’s) is that 21st century Protestant Christianity is superior to the practice of Christianity in previous centuries. This would then lead you into a difficult position, as Protestants generally claim that their approach represents a return to Christianity as it was practiced in the time of the Apostles. How can pietistic Protestantism represent both an improvement upon historical Christianity and a return to it? And if you really want to adopt the view that your novel views are an improvement, how are you not also implicitly adopting a progressive and dialectical view of history? A couple of things. The accusation of ‘pietism’ has been leveled several times but not helpfully. Nobody thinks pietism is good. We presbyterians critique pietism where we see it in our own churches. I don’t want to get into a whole discussion on it, but where it applies to this discussion, perhaps you could be more specific about what acts/beliefs you are labeling as pietism. Second, the thing you are calling “foreign to Christianity as it has been practiced for the last 2000 years” is the very point to be proven. I don’t think that something being outside of the “Orthodox” church makes it foreign to Christianity (because I don’t think Orthodoxy has the corner on that market) and I don’t think something being within Orthodoxy makes it part of Christianity (and of course, when I say Christianity, I mean following Christ). There are folks out there who think that we should be trying to “get back to” the “early church”. Generally speaking however, we don’t think that. And we certainly don’t think that somehow we’re improving the church. These are all easy misunderstandings to make because we aren’t very clear as a “church” since we lack a structured church authority. What breaks my heart is the table-grabbing that goes on and I think if Paul were here today he would write a similar letter to all of us as he did to the Corinthians. It’s not astounding to me that you would claim rights to the table if you alone were The Church. But Jesus is clear that he who casts out demons or he who hands out cups of water, if he does it in the name of Jesus, then he is with us (Mark 9)! It’s becoming clearer to me that the wall between us is ecclesiology and ecclesiology alone. The rhetoric of the Church has not been the rhetoric of Jesus, we use the rhetoric of the Jews. Some say they have the fathers Abraham and Isaac, others say that gathering grain for food must cease on the Sabbath. I agree that doctrine matters but why do we raise stones at one another? It is only as worldly powers started to lose control that these things came to be seen as essentials. Paul says we are complete in Christ and warns us against worldly philosophy and vain deceit. (Col. 2) And what are these worldly philosophies and vain deceits? Anything that says we aren’t complete in Christ. Anything that says we must follow Christ AND. Whether it is AND the meat you eat or AND the drinks you drink or AND your holy days or AND the acceptance of icons. The rhetoric of Christ says follow Me first and I will give you everlasting life and on the way you’re going to learn a whole lot. Okay, so we all follow Christ. Some of us say foolish things and just don’t GET it even though He tells us over and over again (we’ll call them Peters) and others think they have a claim (encouraged by forefathers or a mother) to the right hand at the throne of God (Jameses and Johnses) but Christ is all in all and there are many who build on that extensive foundation, I would that we all built fire-retardently. To go back to JJ’s point, do I think we got away from the apostles and the early church? No! I don’t think any of us got away. I think we’re all having a hard time learning anything from the apostles because we pretty much all claim to possess the foundation that is Christ. Foolishness, foolishness, foolishness. Have we actually learned anything, have we grown at all, if we can’t sit around a table together and eat and pray? But should the Lord grace us with two thousand years or more, we still have much time to grow as a body, much time to learn how the hands work, and what the eye is supposed to do. Ten thousand years from now (God-willing) they’ll be mixing up Father Andrew and Pastor Leithart with Augustine and Athenasius. But in the end, this will all have been to our sanctification, this will have been God’s mysterious way of getting us to the Promise Land. The pietism evaluation is in regard to Leithart’s definition of how one should care communion—he doesn’t seem to believe that doctrine actually matters, even if one’s co-communicant is an idolater. The particulars of this form of pietism are a bit different from the 17th century’s forms, but it’s still essentially the same dynamic. In any event, in a sense it really does boil down to ecclesiology, but it’s even deeper than that: It boils down to authority. We do not believe in Sola Scriptura. History itself shows that the Church produced the Bible, not the other way ’round. By the way, the claim that what you consider to be non-essentials only became essentials when governments became involved is manifestly untrue. Have you read any of the writings of the Fathers? They took these things quite seriously and always have. It is only under the influence of pietism that a certain minority of Christians started to trim down their faith such that what was once essential is now inessential. As for whether we can “sit around a table together and eat and pray,” it seems to me that such language is a deliberate obfuscation of the critical difference between a regular meal at a table and the Body and Blood of Christ. Partaking of the former unworthily will not damn you, but doing so with the latter very well might. As St. Justin Martyr told us in the 2nd c., the Body and Blood of Christ are not received as common food and drink. To demand that the kind of casualness appropriate for lunch be had around the altar of God, the altar whose hot coals not only cleanse the lips of the unclean but burn the souls of the unrighteous, is something that can only make sense in a private interpretation of Scripture that is apart from the Church that produced it. The real “growth” that is needed is for those who have departed from the fullness of the Christian faith to grow up, cast aside their private opinions and theories, and return to the catholicity of the faith. None of us “possesses” the foundation that is Christ, but some have indeed departed and chosen to build on another foundation. The call is not for us all to get past our mutual divisions, as though somehow the Church has failed to exist, as though somehow Christ is actually divided. The call is for the wandering to return from their straying and come home. All are welcome. All are desired. The argument that I made above was not that a practice has to be present within Orthodoxy for it to be part of the tradition; rather, my argument above was that Denominationalism, as practiced within contemporary American society, is a recent development and is foreign to how Christianity has been practiced for 2,000 years. Was that unclear? You can take your pick: Orthodoxy, Catholicism, Lutheranism, Reformed, etc. — none of them treated one another like “denominations” during the Reformation, or the anytime past, until this last century. If Leithart (and you) are drawing upon a denominationalist ecclesiology to legitimize your claims, then — if the above is correct — this is an innovative and a recent perspective. This poses a problem for you if claim that Protestantism is a return to the early church — unless, that is, you want to claim that Christianity is “evolving” or “progressing.” And this is precisely what you do! Despite the qualification that “we certainly don’t think that somehow we’re improving the church,” you do aver, “What we do think is that God is sanctifying his bride and right now this is what that looks like.” This is an implicit admission that the faith handed to the Apostles by Christ was incomplete and is subject to change, what you call further “santification.” And this is implicit in your claims that follow. For instance, when you write that Catholics, Orthodox, and Protestants “all confess salvation through Christ the Son of God,” and “as long as we have that, we can work through everything else.” What you are claiming is that “confessing Christ the Son of God” is the place to draw the line and that other doctrinal differences do not matter. You then reinforce this claim by suggesting that “the common confession of the Trinity and salvation through Christ” is all that is important. As neither the Apostles nor the Greek and Latin Fathers thought this way, you are suggesting that you have been “sancitified” beyond them and their teachings. In other words, you think the Church is evolving or progressing. Again, this is certainly true of Leithart, who has quoted others claiming that such were “immature” in their steadfastness to iconography, the presence of Christ in the Eucharist, or any doctrine that involves the entering of a divine reality into the ontological constitution of a lower one. Now, you probably do not agree with this assessment; you probably think that I am putting words into your mouth or ascribing ideas to you (and Leithart) that you do not explicitly hold. This is not my point; rather, I am claiming that you (and Leithart) are impicitly relying upon a modern conception of historical progress (which is really a distorted and secularized eschatology). This isn’t merely the Christian view that we grow in greater understanding and become “sancitified,” all the while building on the truth that has been revealed to us; this is the modern view that truth emerges out of a historical process and that today’s understanding is better than yesterday’s because it has resolved the contradictions or tensions of yesterday. Yesterday’s truths can be disregarded as somehow inferior (or, in Leithart’s affirmed quotation, “immature” and “childish”). Now again, you probably don’t affirm this explicitly, but it’s inherent in your reasoning (though Leithart DOES seem to affirm this). Let me give you an example. It is one thing to recognize that traditions must change in order to address new challenges and circumstances. Orthodoxy, for instance, has had to adapt itself to various theological controversies, such as the iconoclast or hesychast disputes, providing new elaborations to these subjects in the process. Nonetheless, these new articulations were rooted in the faith that was given the church — in the tradition itself. In this way, the writings of Saint John the Damascene and Saint Gregory of Palamas were building on a tradition, using the substance within it to expand it in ways that reaffirmed its foundation. Whatever then may be novel in their ideas weren’t novel departures, but novel elaborations upon existing traditions of the Church, written in an attempt to remain faithful to it. On the other hand, the argument that all we need to confess is Christ and the Trinity in order to have the fullness of the faith is a novel doctrine that represents a fundamental departure from previous tradition. To uphold it is to countermand the Apostles and the Latin and Greek Fathers by rejecting many of their central assumptions about the Church and the faith, as they never limited the matter to these two doctrines — and I challenge you to find this exact formulation in scripture or any of the writings of the Fathers if you disagree. (And that will be difficult if you insist on Sola Scriptura, since the specific doctrine of the Trinity is not to be found in the scriptures, but in the Nicene Creed.) If you cannot demonstrate that what you are doing is not new and cannot be rooted in the tradition, then what you are doing is a violence to the tradition; it is to depart from it in crucial respects and replace its foundation with that of another. To make a related point, which I think is becoming increasingly evident given your recent response to Father Andrew, you also seem to be question-begging and reasserting your claims without actually responding to criticism. What I mean is that your ideas about communion flow from your premises about ecclesiology, doctrine, etc. When Fr. Andrew questions these premises, it does not do to cite scripture claiming “Foolishness” and that Christians haven’t “learned anything” or “grown at all.” What you are doing in this instance is merely reasserting your unestablished premises by couching them in a particular interpretation of scripture. This is not in any way an adequate response as it does address the challenge to them. You have to show that your ideas are first correct. This requires either: (a) making an historical argument that justifies your views or (b) arguing that we have a better idea of the truth than did our forebears. Leithart seems to subscribe to (b), and you seem to implicitly hold to it. And if it’s (b), my next question becomes what doctrines are immune to further progress? This may appear flippant to you — you certainly dismissed it in your last response when asked if Mormons or Unitarians can commune with you — but it isn’t, my friend. Reformed (Zwinglian) christology is Nestorian. Is that evolution acceptable? Does one even need to confess the Trinity? After all, a number of early Protestants, Socinians especially, rejected the Trinity on scriptural grounds, a conclusion that they drew from the evolved doctrine of Sola Scriptura. Indeed, they were confessing Christ as the Son of God — they just meant this in an Arian-like way. Why is this doctrine then not immune to change and progress? If icons are childish and closed communion obsolete, why not our understanding of God? In other words, why stop where you want to stop? Why not include everything established by Council and Creed? 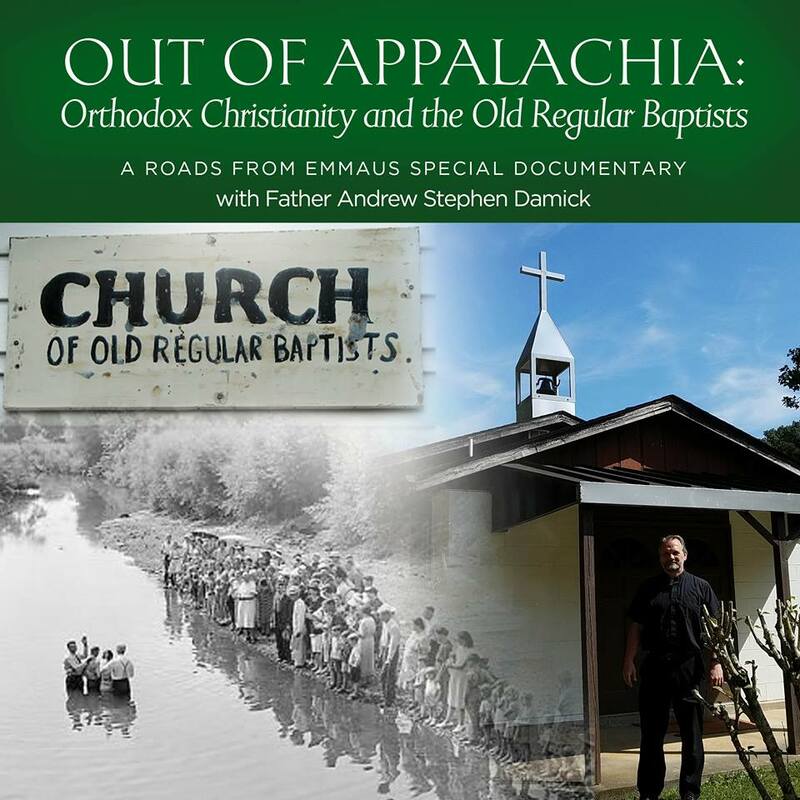 Why not stop where the Socinians did? Or process theologians? Or Jehovah’s Witnesses? Or Atheists? *** None of this is to suggest that the civil and the ecclesiastical, the state and the Church, should be merged. In truth, it was Christianity that wrestled free the sacred from the state — Saint Ambrose’s threat of excommunication to Emperor Theodosius and the submission of the Theodosius to the Church being a prime example of this very new arrangement — and the Church, both in the East and in the West, maintained independence from kings and emperors, though each in their respective ways. (Protestantism, though, reversed this, especially with its embrace of Erastianism in the 16th century.) Nor am I suggesting that sacrifice and allegiance to one’s own country is problematic. The difference, however, is that in premodern life there was no abstracted and distant “nation,” no simple space that was called “society,” but rather a hierarchically organized series of overlapping complex spaces: the Church, civil authorities, families, guilds, towns, etc. Each of these authorities had their own laws and own logic. The Church had cannon law, which applied to some matters; the civil authorities had laws that applied to keeping the peace; guilds had laws involving commerce; and so forth. With the nation-state came a new thing that replaced all of these with one law, one market, and one new universal community — and one that monopolizes public space to the detriment of faith. Sorry, it took me a while to read this. It has been difficult to have this discussion on the internet because while we most certainly disagree, an actual head-on collision has been missed in the night I think. But not without some fruit, I think the terms of elaborating vs. departing (thanks JJ) would be helpful to establish a clear track in any future discussion. I’ve tried to back up my arguments with Scripture, but of course that holds no weight here. I am familiar with the Church Fathers, but not enough to take up my City of God or such and contribute here helpfully, but I stand on their shoulders as well as I am able. On the one hand, as one of you says, the faith handed to the Apostles was complete, because the faith handed to the Apostles was in Christ. But on the other hand, as the other one of you pointed out, the Church has essentially produced the Scriptures (they are God-breathed, but I think we mean the same). The Apostles Creed helped us to make sense of God’s word, but as the Church faced new challenges, they expanded into the Nicene Creed and so on. I believe that the state of the Church (the WHOLE Church, not Orthodoxy) is a new challenge we are facing and that we will come out on top with some very helpful elaborations in God’s timing. I think that basically you would agree with me (perhaps phrasing it differently), except that we each think the elaborations will look differently. You think it will look like us “separated brothers” returning to the Orthodox Church (perhaps little need for elaboration, perhaps some), while I think there will be a glorious and new unification of the body, with needs for much elaboration- on how we love, serve, commune and coexist as the body of Christ. (because until five-hundred years ago there were only two churches, each happy to say that they were The Church, we haven’t actually faced a new challenge here yet, we’ve just continued with our own status quo, in fact, that is exactly what the Orthodox Church is doing). I think somewhere in the above there is grounds for a productive discussion. One final thought, God could raise apostles from stones if it was for his glory. Cling to Christ, not your own body. Cling to Christ, not your own body. I’m actually quite the fan of Augustine’s phrase totus Christus, caput et corpus (“the whole Christ, Head and Body”). The Church is Christ, you see, which is why it cannot be divided. You can insist on phrases like “the WHOLE Church, not Orthodoxy,” but that is really just asserting your ecclesiology without actually arguing for it. It seems to me that you posit an ecclesiology of the divided Christ—each “church” has only some of the Lord, some of the faith, and some of the baptism, rather than the one asserted by Scripture. I’d be interested in how you imagine this could actually play out in the real world. I ask this because sometimes looking at the practical implications of theoretical wishes help illuminate the issues. Let’s start by imagining that just the Reformed Catholics and the Orthodox Church hold a council with the express purpose of uniting in “love, service, communion & co-existence.” Let us further imagine that both parties agree to “reform” what is wrong in their belief systems, no matter how old or “near and dear” they are. What would be “on the table” in these discussions? We might be able to make some progress on differences in the so-called “minor” or non-essential issues, however they may be defined. Obviously, the “major” issues would be a big problem (icons, Mary, prayers for the departed, etc.). You might say, let’s not spend any time on what we agree: the authority of Scripture, the books of the NT, the Trinity, the Natures/Person of Christ, etc. But I say, “Wait a minute. Why would those NOT be on the table?” If we start with the premise that we have to correct what is wrong in both of our camps, why are the things on which we agree not potentially wrong? How do we know, with complete certainty, that the fourth & fifth century Church got these beliefs right? These would have to be reviewed if we were acting in good faith. Therefore, the battles of the fourth & fifth centuries would have to be fought once again. If not, why would the first three or four Councils of the undivided Church be arbitrarily accepted (or certain parts of their canons) while the decisions of the next three are review-able? What changed, after the fourth Council, that made the next three unreliable? So, we would have to go back to the very beginning and start over in determining correct belief. But, this is an obvious insult to the Holy Spirit. We either throw out His guidance of the Church in history or accept that the Church has always been Christ’s Body under His guidance – when battles have been fought and resolved, there is no reason to re-visit them. We cannot arbitrarily pick a time in history when the Spirit stopped leading the Church into all truth – whether it is the fourth, sixth, ninth or twenty-first century. There has to be an identifiable, tangible organization called the Church that has been here from the beginning that holds concrete truths and dogmas in its bosom – beliefs and practices that are there because of the organic guidance of Christ Himself through the Spirit in His Body. An unidentifiable list of non-negotiable doctrines held by an invisible “church” holds no authority over any person’s life and offers no promise for a united future for Christians. For now this former Baptist says a hearty Amen. I plan a more detailed (and possible cross-post) later. Thanks, Fr. Andrew for your work here. Is there anything in Leithart’s statements that could not be found in Zwingli’s playbook? What is uniquely “Leithart”? Just curious …excuse my ignorance. The answer to that is far more than I have the knowledge to give. Suffice it to say, though, that Leithart is something of a “high Calvinist” and not really Zwinglian, though he does seem to use some of Zwingli’s “plays” (to use your metaphor). Unlike Zwingli, he does regard the Eucharist as something far more than mere sign. Most of the post is quoting someone who he ostensibly agrees with. This is getting more bizarre and ad hoc: apparently, the destruction of the Temple in 70 AD is the “definitive end of all temples” rendering “the idolatries practiced by Rome and Orthodoxy” as inherently “childish.” And against his earlier, more conciliatory claim that the Orthodox and Catholics practice high place idolatry over the more problematic golden calf variety, he now affirms, “When such childishness is taken up again in adulthood, the guilt is multiplied,” and, “Evil is practicing what is immature in adulthood.” So now Orthodox and Catholics are “Evil” because they indulge in certain practices when they should really know better. How does this make “high place” worship less idolatrous than outright pagan worship? Those poor pagans did not know better, after all. Fascinating! Thanks for this. It really is quite shrill, isn’t it? I note especially this notion of “earlier forms” of the Church. One can only conclude that Christ Himself is evolving. Exactly. I think that this has to be the ultimate approach that any philosophically inclined and historically aware Protestant must take in order to remain consistent. The Scriptures and the Fathers implicitly approach reality as a unification of the physical and the spiritual, of the seen and the unseen. Thus, any part of reality can participate in something that is greater than it: an icon is not just paint on a canvas, but a window into eternity, there is the real presence of Christ in the Euchartist, etc. Protestantism and modern philosophy are in many ways derivative of late medieval and early modern philosophical nominalism, which denies the existence of universals and participation. Instead, universals are things that exist in name only as terms — captive to language and the human mind, but not in any way real. In philosophy, this eventually fueled Cartesianism, Kantianism, idealism, materialism, and more. All of these frameworks deny the unity of the material and immaterial in reality, as well as human participation in and access to that reality. In theology, we get the denial of those doctrines mentioned above and a slew of other heresies, such as Reformed Christology, which stipulates that the unity of two natures in the single person of Christ is only a verbal and not a real predication — a modern reinvention of Nestorianism. The philosophically and historically inclined Protestant then eventually becomes aware that his or her ideas are derivative of or descendant from a novel theological and philosophical way of thinking that is no older then the 14th century. To then square this perspective with scripture and his or her faith requires a form of developmental historicism that posits real evolution or progress in history (which idealist forms of modern philosophy handily provide). In agreement with another Protestant, Leithart affirmed many years ago, ” The Reformation is the legitimate offspring, the greatest act of the Catholic Church.” Elsewhere, he has recently claimed, “Of course Newman said ‘to be deep in history is to cease to be a Protestant.’ To think all you need is behind you is to be Catholic already.” On the other hand, “Protestantism is dizzily open-ended, like life. To rejoice before an unruly future is to cease to be Catholic.” This all very much looks like a progressive view of history to me with a forward-looking Protestantism evolving out of Catholicism, which is obsessed with looking backward. Would you mind if I quoted your responses in another post commenting on Leithart’s latest on this? Go ahead, though I suppose that Tawni Rebecca Martini below has a fair criticism of my argument, which is that perhaps it isn’t as fair to attribute the claims in Leithart’s last post to him as he was quoting someone else. Still, he did so without qualification, so then perhaps not. Another problematic bit is that I think Leithart would probably deny that he holds to a progressive view of history — such a position is very unfashionable in most circles these days, often considered a relic of 19th century thought — and he seems to be very critical of Hegelian historicism. Nonetheless, if he is relying on Barfield (an extremely marginal figure), such is implicit in his thought, despite any denials to the contrary. Honestly, I just think he suffers from philosophical and theological incoherence on very many levels. His views are extremely inconsistent. As a convert from Leithart’s “Reformed Catholicism”, I can confirm that (at least last I checked) most if not all of the main thinkers in this group do indeed hold to the idea of “semper reformanda” as a “progressing” (as biblicists, they would avoid “evolving”) church. That some things might have been okay in earlier iterations of the church that aren’t now that “we know better”, and that the Orthodox’s main problem is being stuck back in the 1000s someplace is not at all foreign to their thinking. Plus, with their strong Calvinist view of God’s sovereignty, they consider all the splintering into denominations, while sinful, obviously part of God’s plan (as it did happen, after all). One even compared it to cell division in a developing baby. No joke. FWIW, I locate the genus of this movement shortly after the fall of the Soviet Union, when James B Jordan took a trip to Russia to train Presbyterian pastors, encountered the Orthodox church, and didn’t convert. I’ve heard recordings of some of his earlier talks (before they started hemorrhaging converts to Orthodoxy), and he was playing a Russian litany as “This is what Church Music should sound like,” as well as basically teaching theosis without using that word. Also, JJ, you may have missed the short introductory paragraph which attributed the rest of the post to Rich Bledsoe (another “Reformed Catholic”, generally more shrill than Leithart). While Leithart agreed enough with what was said to make a blogpost of it, those are not technically his words. Within “final participation,” all things become mental and internalized. Participation is affirmed from the inside; it does not actually exist in the external world. This is a gnostic denial of the good of the created order, one that posits the real as a product of “mental constructs, not golden, or silver, or brass, or wooden,” or any other material things. The real is a construction of our minds. This is why modern idols are idealogical rather than material — only mental constructs constitute what is really real and thus material things cannot be a focus of idolatry. Furthermore, it denies that the truth can ever be articulated as he affirms (and emphasizes) that even the “Westminster Confession” (of which he is an adherent) is an idol. What does this make the truth then? An esoteric or intuitive knowledge that cannot be brought forth into the world? Is this why he downplays the importance of doctrine? And how is this not gnosticism? Or even coherent with Christianity and his fondness for Deconstructionism? How does even his thinking on “final participation” or any aspect of Theology escape the charge of idolatry? It’s interesting that Leithart characterizes the Orthodox and Roman Catholic Churches as childish. While I certainly wouldn’t call them childish as in immature, I have often sensed a child like quality to Orthodox worship. And I mean that in a good sense, as in Jesus’ description of true faith. JJ- thank you! In just a few blog comments and good links, you’ve helped me to finally process my philosophy minor through the Orthodox lens. You’ve absolved me from the nagging suspicion that I should reread all those old Kant/Hegel/Fichte articles I’ve got packed away somewhere. 🙂 Transcendental apperception say what? Leithart’s very peculiar and incoherent understanding of the concept of idolatry almost certainly has its origins in Barfield’s book “Saving the Appearances”. In any case, I think a well-considered examination of Leithart’s thinking, where it comes from and where it ultimately leads, could quite possibly give a death-blow to the premises of “Reformed Catholicism”. I should also note that Barfield didn’t come to his brand of idealism honestly, but rather through the very weird “anthroposophy” of Rudolf Steiner…..